Potatoes are rich sources of nutrition and health. While the pulp is eaten throughout the world, the peel is generally thrown away. Here are few health benefits of potato skin. 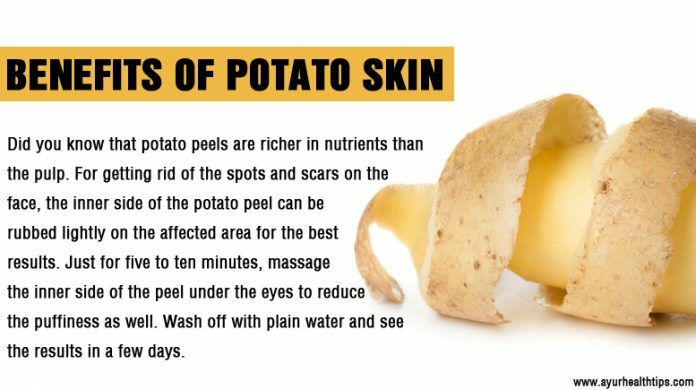 Potato peels help you to get rid of dark circles beneath the eyes no matter how dark. Rubbing potato peels on the affected area for five to ten minutes every day will show visible results. Applying a paste of potato peels with turmeric also helps in reducing wrinkles and firming the skin for a younger looking you. Add eggs, lemon juice and potato peels and rubbing the scalp with it, promotes healthy hair growth and cleans common problems of a scalp like itchy and dry scalps. Alternatively, it also cleanses the dandruff completely. So while you are busy stocking up on the potatoes, the peels should be stored in air tight containers and refrigerated such that they are used to benefit your health and body in a natural way. Nothing can soothe your skin better than the potato peels with their skin soothing properties and anti-inflammatory elements!